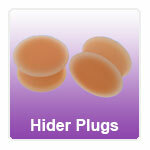 Flexible Hider Plugs for Ear Stretching. Our Silicone Ear Jewellery is made from implant grade silicone making it very safe for body piercing use and ideal for people with metal allergies. Can silicone be used in new piercings? Are silicone plugs comfortable to wear? The pliable nature of silicone makes it incredibly comfortable to wear. Any external pressure or accidental impact will cause the jewellery to flex and therefore greatly reduces the risk of any damage making silicone ideal during sleep or during sports..
Is Silicone suitable to wear in the shower or while swimming? You should not experience any problems with silicone during normal showering or bathing, however we do not recommend that you wear silicone during swimming as the chemicals may cause a discolouration to occur. You could always keep a spare set just for swimming if you prefer. Has anyone had allergic reactions or problems whilst using silicone? There have been some cases of irritation, mostly caused by using Silicon plugs or Eyelets for stretching (which we DO NOT recommend), other problems have been reported by people with pet dander / pollen allergies. The tacky nature of the silicon can cause irritants to adhere to the surface causing your real allergic reaction. Washing the jewellery will eliminate this concern, but sadly not for people with highly sensitive allergies. Please ensure that all soap is fully rinsed off as soap WILL irritate your lobes. Do you require any form of lubricant when inserting / removing jewellery? Is silicone suitable in extreme temperatures? Yes, unlike steel or glass, silicone is EXCELLENT in extreme temperatures. Can I wear silicone during sports or under a motorcycle helmet? How do I care for my silicone jewellery? The silicone can be autoclaved if you wish but even if it has been autoclaved you must wash it with soap and warm water prior to use (ensure that all soap is rinsed out completely). The reason for this is that although the flash (tiny bits of silicone from the moulds that "stick" to the jewellery) has been removed prior to shipment, sometimes there may still be some remaining which would irritate your piercing. For ease during insertion (and removal) we recommend that both the jewellery and piercing is lubricated with body friendly oils (Vitamin E, Olive, Jojoba, etc) especially if you have sensitive skin. To insert fold / squish in half (and if possible in half again) then slip it into your piercing and gently let go. It will resume its shape once inserted into your lobe.